Sometimes, giving a gift card during the holidays can feel a little impersonal, so I like to dress them up with a mini Christmas stocking ornament. 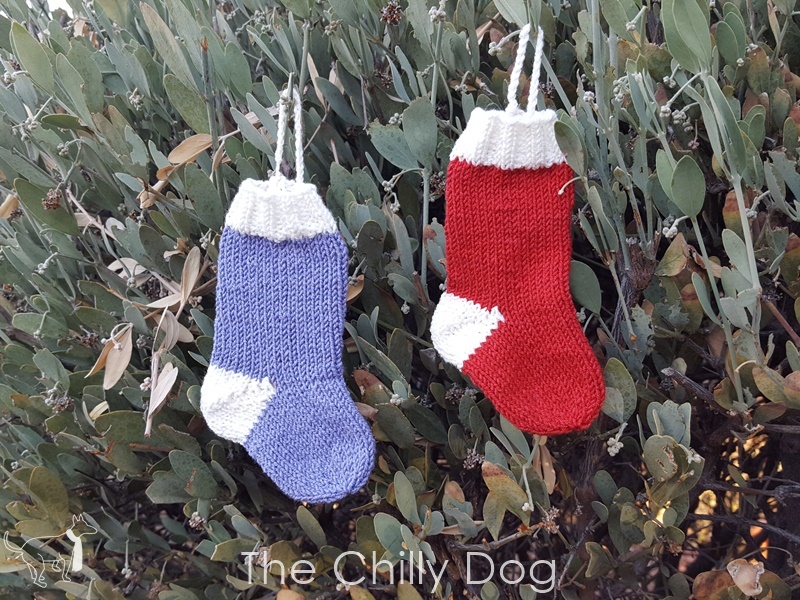 These mini Christmas stockings are great because they are fairly quick to knit, you can use up leftover yarn bits from your stash and you can practice your sock knitting techniques on a small scale. All rnds: [K2, p2] around. On RS, knit stitch, turn work, slip stitch to right needle, pull working yarn firmly over the right needle. On WS - purl stitch, turn work, bring working yarn forward between the needles, slip stitch to right needle, pull working yarn firmly over the right needle. The cuff, and heel of the sock are worked in Color A. The remainder of the leg and foot of the sock are worked in Color B. Rnds begin/end at the side of the sock. With Color A, CO 32 across 3 or 4 dpns, leaving a 24 inch tail to make a loop later. Work 8 rnds of 2 x 2 Ribbing. With Color B, K all sts for 27 rnds (2 ½ inches). Do not cut or break Color B. Row 1 (RS): K15, ds in next stitch. Row 2 (WS): P14, ds in next stitch. Row 3: K13, ds in next stitch. Row 4: P12, ds in next stitch. Row 5: K11, ds in next stitch. Row 6: P10, ds in next stitch. Row 7: K9, ds in next stitch. Row 8: P8, ds in next stitch. Row 9: K7, ds in next stitch. Row 10: P6, ds in next stitch. For the second half of the heel, consider both front strands of the ds as a single stitch. Row 11: K6, k in ds, ds in next ds. Row 12: P7, p in ds, ds in next ds. Row 13: K8, k in ds, ds in next ds. Row 14: P9, p in ds, ds in next ds. Row 15: K10, k in ds, ds in next ds. Row 16: P11, p in ds, ds in next ds. Row 17: K12, k in ds, ds in next ds. Row 18: P13, p in 2 ds. End Color A.
Rnd 19: Continuing in rnds with Color B and RS facing, k15, k in ds, k16. K all sts for 15 rnds. Rnd 2-3: K all sts. Cut the yarn leaving a 12 inch tail. Using a yarn needle, draw the tail through the remaining 8 sts to finish. 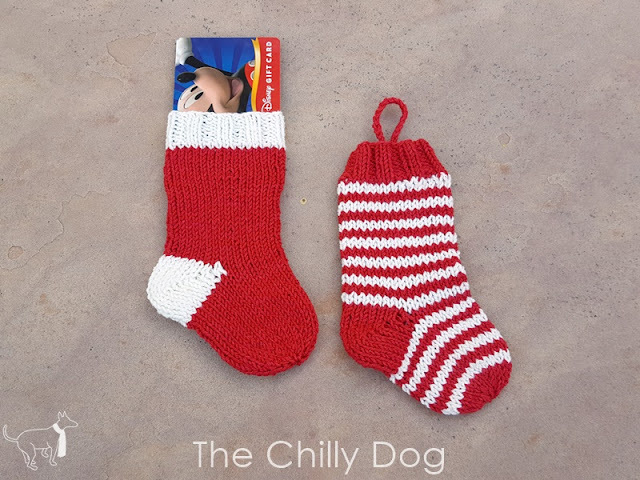 Using the CO yarn tail and a crochet hook, insert the hook into the CO edge and pull up a loop, chain 20 sts, fasten off and attach to the cast on edge to form a loop to hang the ornament. A printable version of this Gift Card Sock Ornament is available in my shop and also includes directions for a striped version of the Christmas Stocking. 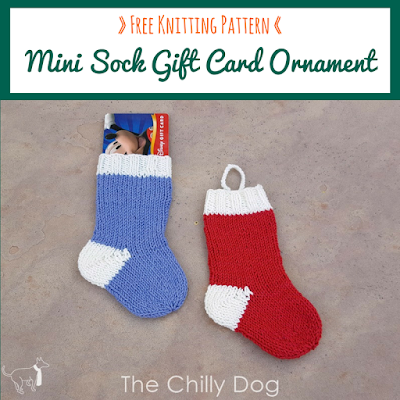 Dress up your gift cards this holiday season with a free knitting pattern for mini Christmas stocking ornament gift card holders.